The oldest district in the modern metropolis of Taipei goes by many names - To some it is “Bangka” (Báng-kah khu) or “Monga” (艋舺) and to others it is “Wanhua” (萬華區). Whatever you prefer to call the district, it is one of the most important districts in the city and is steeped in history, culture and religion. Once one of the most prosperous districts in the city due to its proximity to the Xindian River (新店溪), the district served as a centre of commerce for over three hundred years. The area was originally settled by the Pinpu Kaitakela tribe, then Hokkien (閩南人) immigrants from Fujian Province and most recently by Chinese refugees of the civil war. Today the district is in a period of decline and has an aging population that is regarded as the “fattest” in the city - It is well known for its historic sites which include Longshan Temple (龍山寺), Taipei’s most popular temple as well as the Qingshui Temple (艋舺清水巖), Bopiliao Historic Street (剝皮寮老街) Huaxi Night Market (華西街夜市) and Ximending (西門町), Taipei’s answer to the hip and modern Shibuya shopping district in Tokyo. If you want to experience the historical side of Taipei, there is no better place to visit than Bangka. This area is unlike any other area of Taipei - Not only will you find history, but walking around gives you the distinct feeling that you travelled back in time to an older, livelier and somewhat seedier version of the city. So far my series on Bangka has been split up into three sections. The next three sections will be some simple street photography and I plan on ending it all with a post on Longshan Temple. These posts will consist of street photos of the residents of Bangka around the park, in the temple and on the streets in the historic area of the district. This area is a great area for street photography and I hope to show a bit of what life is like in the district through the photos. 1. A Gathering of the Minds. 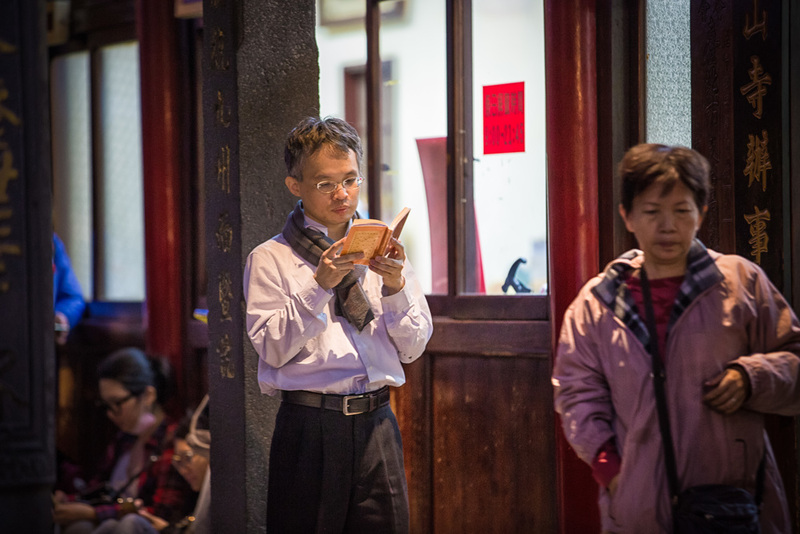 Longshan temple is a really scared place in Taiwan and its constantly full of activity – That doesn't mean it can't be a place for people to hang out as well. In this shot you can see four Buddhist women sitting off to the side of the main temple having a chat and using their prayer beads. Buddhist practice can sometimes be a solitary thing so it's important for people to have a bit of fellowship from time to time. This photo caught my attention because the woman was sitting against the wall reciting sutras like a lot of the other people at the temple but she was also wearing one of the uniforms that the women who chant every night at the temple. I had missed the chanting time which is generally one of the most important and busiest times of the day at the temple, but she seemed to have stuck around for a little more work. This guy was sitting in the middle of the thick of things where people are lighting their incense and doing the majority of their prayers facing the main shrine. He just sat himself down and was using his prayer beads at the same time. I was lucky to catch him looking directly at me at the same time I took the photo. Prayer beads generally wrap around your wrists but this guy the XL version and was busy reciting while looking at the weird-looking foreign guy! Whenever I visit Longshan it is usually in the early evening or at night. When I visited this time I was there in the early afternoon. This kind of shot is quite common and isn't very special but the reason I include it here and not in the gallery below is because I like the light. 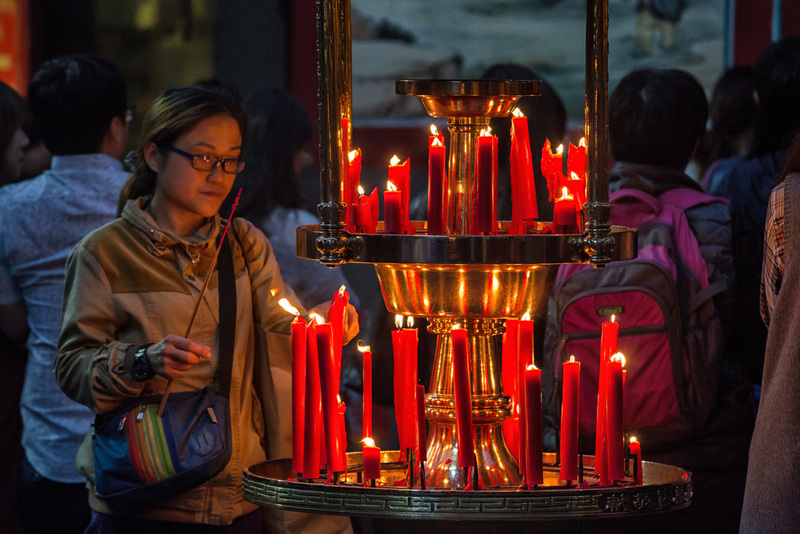 It's not common to get this kind of light and I like the way it shines on the young woman and the incense urn in front of here. This shot interested me because I noticed the monk was hanging out in the security office while the security guard was watching people outside the door. They both seemed to notice me at the same time and glanced over as I took the shot. It's interesting to see security at a temple in Taiwan but Longshan temple isn't your typical temple so it's probably not that strange. I'm always interested when I'm at the temple to get shots of peoples hands. I'm including these two shots for different reasons. The first shot is of a woman reciting Buddhist sutras while another woman is walking by in high-heels at the main hall of the temple. The second shot is of a woman with prayer beads hidden in the corner of one of the rear hall shrines. She was hidden from plain sight, so I focused on her hands and what she was doing instead and I like the result.